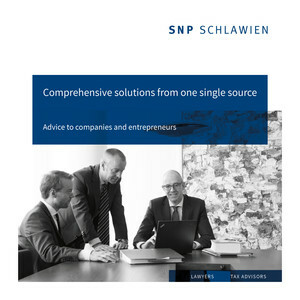 SNP Schlawien is one of the leading commercial law firms in Germany with a special focus on medium-sized businesses. As a full-service law firm, we advise and represent our clients throughout Germany with more than 80 attorneys at law, notaries public and tax consultants comprehensively in all legal and tax aspects. Our clients appreciate the direct contact to their consultant at our locations in Berlin, Dresden, Dusseldorf, Frankfurt am Main, Freiburg, Leipzig and Munich. With the expertise, personal commitment, as well as the cooperation across legal areas and locations of our advosors, we always guarantee one-stop optimum solutions to issues for our clients. Your concern is given top priority; you are in the center of our attention in our day-to-day work and may expect highly qualified advice at a good price-performance ratio. We listen to you carefully, analyze all possible options scrupulously and finally find the precisely fitting solutions. We cater to your needs and concerns in each single case in an individual and flexible manner. We are a member of LNI Legal Network International, an international association of leading law firms with more than 5,000 legal advisors in more than 60 countries, who is ranked in Band 1 of the Leading Law Firm Networks in the current issue of the international directory Chambers & Partners.